This experiment investigates the absorption spectra of a series of 3,3’-diethylcyanine iodide dyes. The main procedure is in your text, provided as photocopies in the following pages. Use this section as supplemental material. The dyes absorb radiation in the visible range of the electromagnetic spectrum (400 – 800 nm) and are considered a classical example of the particle-(electrons)-in-a-box (a chain of atoms) problem. Investigation of the wavelength of maximum absorbance allows for the calculation of the transition energies. Dimerization of the dyes can be also investigated by analysis of the shoulder effect on the spectra. Refer to References in the experiment from Shoemaker (included) for theory and experimental comparison. Look up the structures of these compounds before coming to lab. These dyes are highly toxic. Wear gloves and goggles at all times. The samples are prepared as 10?M solutions in methanol. You will use the HP-8452A UV-Vis spectrophotometer. First you must “blank” the spectrophotometer by recording and storing in memory a spectrum of the solvent (methanol in this case) and the cuvette. See the instruction for use of the spectrophotometer. After zeroing the instrument, carefully pipet 1 - 2 ml of Solution #1 into a clean, dry sample cuvette. Be sure there is enough volume in the cuvette so that the light beam passes through the sample. Record an absorbance spectrum between 390-800 nm. Record the wavelength at the maximum absorbance value. Be sure to record the wavelength of any shoulder observed. Take absorbance spectra of each dye. A shoulder should be more readily observed in solution #2. Take an aliquot of Solution #2 and dilute it tenfold. Record your observations. Does shoulder diminish? What do you think the shoulder is due to? Calculations 1. Calculate the transition energy ?E in eV for each dye using the experimental wavelengths. 2. Calculate the ? values for each dye. Find the average value of the ? values for the series of dyes. 3. Calculate the theoretical ?E values with ?=0 and ?=the average value determined. 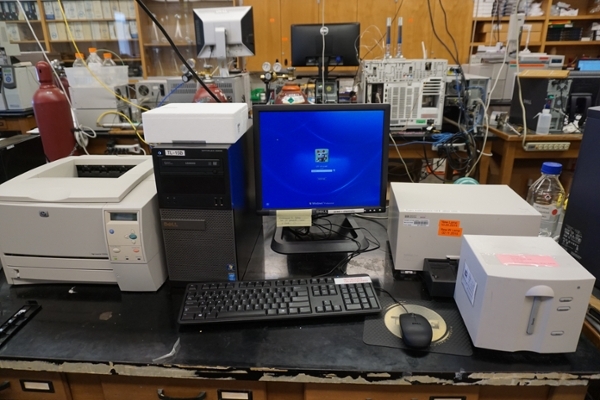 The Agilent (HP) 8453 UV-Vis unit in room 3480 is pictured below. Turn on instrument using power button (lower left corner of instrument). Wait for the indicator to turn green (3-5 minutes), then launch software. **** instructions from this point are out of date and in edit. Ask TA for advice!!! ****. Put pure methanol into the cuvette and put the cuvette in sample holder. Make sure the clear sides face the instrument. Make sure you depress the lever on the side of the cell holder to hold the cuvette in place. Click function key F2 to measure the blank. This takes a spectrum of the solvent and cuvette and stores it in memory. This is then subtracted from all subsequent scans. Place the cuvette containing the sample in the cell holder. If you are using the same cuvette, rinse the cuvette with the new solution two or three times before taking the spectrum. Click F1 (Measure sample). The spectrum will appear on the screen. Click F2 (Cursor control). Use the left and right arrows to find ?max and any shoulders in your spectrum. Click F1 (Mark) at each wavelength you want to record with cursor position. Click F9 (hardcopy) will print your spectrum with cursor marks and wavelengths indicated. Be sure to tabulate all experimental findings and calculated energies. What does ? correct for? For which dye is ? the greatest, smallest? Explain. How well does \(\alpha\) correct the wavelength? Do you observe any dimers? What features of the spectrum indicate the formation of dimers and higher order aggregates? What happens upon dilution?